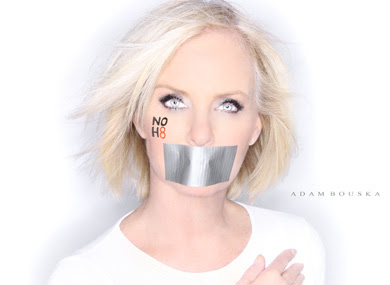 The announcement Wednesday that Cindy McCain had come out for marriage equality by posing for the NOH8 campaign may have changed a few people’s opinions about the former would-be first lady. But it appears that Mrs. McCain’s photo session has done little to change her husband’s mind about marriage rights for gay people. Senator John McCain’s office has issued a statement saying that the senator respects his family members’ views, but that he is still opposed to gay marriage, The Washington Post reports. “Sen. McCain believes the sanctity of marriage is only defined as between one man and one woman,” the statement said. It's the same statement McCain made to Ellen DeGeneres before she got married in 2008 (see the video below). is now available on iTunes. Shonn Wiley, and The Joe Iconis Family. California, denying thousands of couples the right to marry. careers are helping to pave the way for LGBT Equality. cover a wide variety of hot topics relating to the mission of BSO! expound on their craft and showcase their talents. To learn more, visit www.broadwayspeaksOUT.com or www.spaceonwhite.com. Two-time Academy Award-winner Denzel Washington will star in the first Broadway revival of FENCES, the 1987 Pulitzer Prize and Tony Award-winning play by August Wilson. The production will also star Tony Award-winner and Academy Award-nominee Viola Davis. FENCES, directed by Kenny Leon, will open on Monday, April 26, 2010 at the Cort Theatre (138 West 48th Street). The strictly limited 13-week engagement will begin previews on April 14. FENCES will be produced by Carole Shorenstein Hays (who produced the original Broadway production) and Scott Rudin. FENCES is one of the ten plays in August Wilson’s sweeping Pittsburgh Cycle, focusing on the twentieth century African-American experience. FENCES takes place over eight years from 1957 to 1965. Denzel Washington stars as Troy Maxson, a Pittsburgh sanitation worker who once dreamed of a baseball career, but was too old when the major leagues finally admitted black players. As he faces off against the racial barrier at work and his own disappointments, Troy also grapples with his son, Cory, over the teenager’s hope for a football scholarship and with his wife, Rose (Viola Davis), who confronts Troy over a child he has fathered with another woman. Denzel Washington returns to Broadway for the first time since starring in Julius Caesar (2005). He made his Broadway debut in Checkmates (1988). Other theatre credits include Richard III, The Mighty Gents, Ceremonies in Dark Old Men, When the Chickens Come Home to Roost and an Obie Award for A Soldier’s Play. He is a two-time Academy Award winner for his performances in Training Day and Glory and received Oscar nominations for his performances in The Hurricane, Malcolm X and Cry Freedom. His other films include The Book of Eli, The Taking of Pelham 123, The Great Debaters (directed), Inside Man, Déjà Vu, American Gangster, The Manchurian Candidate, Out of Time, Man on Fire, Antwone Fisher (directed), John Q, Remember the Titans, The Bone Collector, Fallen, He Got Game, The Siege, Courage Under Fire, Crimson Tide, Devil in a Blue Dress, Much Ado About Nothing, Philadelphia, The Pelican Brief and A Soldier’s Story, among others. He produced the Emmy-nominated documentary “Half Past Autumn: The Life and Works of Gordon Parks” for HBO and was executive producer for the Emmy-nominated “Hank Aaron: Chasing the Dream" for TBS. Viola Davis won Tony, Drama Desk and Outer Critics Circle Awards for her performance in August Wilson's King Hedley II. She was nominated for an Academy Award, Golden Globe, SAG and Critics Choice Awards and won the National Board of Review Award for Best Breakthrough Performance for Doubt. Broadway: August Wilson's Seven Guitars (Tony, Drama Desk nominations, Outer Critics Circle, Theatre World Awards). Roundabout: Intimate Apparel (Drama Desk, Drama League, Obie, Audelco Awards). Public: Everybody's Ruby (Obie, Drama Desk Award, Outer Critics Circle Nomination for Featured Actress), Pericles, As You Like It. Off-Broadway: God's Heart (LCT). Regional: ACT, Sundance Theatre Institute, Trinity Rep, Goodman, Guthrie Huntington Theatres. Film: Law Abiding Citizen, State of Play, Nights in Rodanthe, Disturbia, The Architect, Get Rich or Die Trying, Out of Sight, Solaris, Traffic and Antwone Fisher Story (Independent Spirit Award nomination). Upcoming films include Eat, Pray, Love; Trust; Knight & Day. TV: "The United States of Tara," "Stone Cold," "The Andromeda Strain," "Traveler," "Law & Order: SVU," "Law & Order: Criminal Intent," "Without a Trace," "Amy and Isabelle," "Life is Not a Fairytale: The Fantasia Barrino Story," "Century City," and "City of Angels." Viola presently lives in Los Angeles with her husband Julius Tennon. August Wilson authored Gem of the Ocean, Joe Turner’s Come and Gone, Ma Rainey’s Black Bottom, The Piano Lesson, Seven Guitars, Fences, Two Trains Running, Jitney, King Hedley II and Radio Golf. These works explore the heritage and experience of African Americans, decade by decade, over the course of the twentieth century. His plays have been produced at regional theatres across the country and all over the world, as well as on Broadway. In 2003, Mr. Wilson made his professional stage debut in his one-man show, How I Learned What I Learned. His works garnered many awards, including Pulitzer Prizes for Fences (1987) and The Piano Lesson (1990), a Tony Award for Fences, Great Britain’s Olivier Award for Jitney, as well as eight New York Drama Critics Circle Awards. Additionally, the cast recording of Ma Rainey’s Black Bottom received a 1985 Grammy Award, and Mr. Wilson received a 1995 Emmy Award nomination for his screenplay adaptation of The Piano Lesson. He received many fellowships and awards, including Rockefeller and Guggenheim Fellowships, the Whiting Writers Award, the 2003 Heinz Award, the 1999 National Humanities Medal from the President of the United States and numerous honorary degrees from colleges and universities, as well as the only high school diploma ever issued by Carnegie Library of Pittsburgh. He was an alumnus of New Dramatists, a member of the American Academy of Arts and Sciences, a 1995 inductee into the American Academy of Arts and Letters and posthumously inducted into the Theatre Hall of Fame in 2007. On October 16, 2005, Broadway renamed the theatre located at 245 West 52nd Street the August Wilson Theatre. Mr. Wilson was born and raised in Pittsburgh and lived in Seattle at the time of his death. He is immediately survived by his two daughters, Sakina Ansari and Azula Carmen Wilson, and his wife, costume designer Constanza Romero. Kenny Leon directed the Broadway productions of August Wilson’s Radio Golf (three Tony nominations), Gem of the Ocean (five Tony nominations) and the Tony Award-winning revival of A Raisin in the Sun; for the latter, he earned a Drama Desk nomination. Off-Broadway/regional: Emergence-See featuring Daniel Beaty, Blues for an Alabama Sky and From the Mississippi Delta (Huntington Theatre), Oregon Shakespeare Festival, San Jose Rep, Goodman Theatre, Hartford Stage, CenterStage, Public Theater, Center Theatre Group, Cincinnati Playhouse in the Park, Dallas Theater Center, GA Shakespeare Festival, Arena Stage and the Theatre of the Stars. Leon is founding artistic director of True Colors Theatre Company, dedicated to diversity and the preservation of African-American classics, and served as artistic director of the Alliance Theatre for more than a decade, where he produced ten world premieres, including Elton John’s Aida and Debbie Allen’s Soul Possessed. Leon served as artistic director for the Kennedy Center’s 2008 staging of all 10 plays in August Wilson’s Century Cycle. Other recent credits include the world premiere of Toni Morrison’s opera Margaret Garner and the TV film adaptation of Lorraine Hansberry’s A Raisin in the Sun. Leon is a graduate and honorary Ph.D. of Clark Atlanta. Additional casting and production team for FENCES will be announced soon. Lily Taylor joins Broadway bound "Lips Together, Teeth Apart"
Patton Oswalt (Sam Truman) and Lili Taylor (Sally Truman). LILI TAYLOR (Sally Truman) won both an Obie Award and a Drama League Award for her performance in Aunt Dan & Lemon and earned a Drama Desk Award nomination for The Dead Eye Boy. She has also starred in Landscape of the Body, Mourning Becomes Electra and Aven’ U Boys. She made her Broadway debut in Chekov’s Three Sisters and made her directorial debut with Halcyon Days for her own theatre company, Machine Full. Taylor has received praise for her wide range of performances on film, stage, and television. She next can be seen in Antoine Fuqua’s Brookyln's Finest and most recently appeared in Michael Mann’s Public Enemies opposite Johnny Depp. Recent films include Starting Out in the Evening opposite Frank Langella, The Promotion opposite John C. Reilly, The Secret, The Notorious Bettie Page and Factotum, earning her best actress at the Copenhagen Film Festival. Other films include A Slipping Down Life, Casa de los Babys, Live from Baghdad, High Fidelity, Pecker, Short Cuts, Ready to Wear, Born on the Fourth of July, Dogfight, Say Anything, Mystic Pizza, Arizona Dream, and The Addiction. Taylor earned an Emmy nomination and a Screen Actor’s Guild Award for her work on “Six Feet Under,” a Blockbuster award for Ransom, an Independent Spirit Award for Household Saints, and the first Special Grand Jury Prize for Acting at Sundance in 1995 for her work in Girls Town, Cold Fever, and I Shot Andy Warhol. Roundabout Theatre Company’s 2009-2010 season includes Michael Stewart, Lee Adams and Charles Strouse’s Bye Bye Birdie, starring John Stamos, Gina Gershon, Bill Irwin & Nolan Gerard Funk, directed and choreographed by Robert Longbottom; Carrie Fisher’s Wishful Drinking, directed by Tony Taccone; Theresa Rebeck’s The Understudy, with Mark-Paul Gosselaar, Justin Kirk and Julie White, directed by Scott Ellis; Noël Coward’s Present Laughter starring Victor Garber, directed by Nicholas Martin; Stephen Sondheim and James Lapine’s Sondheim on Sondheim starring Barbara Cook, Vanessa Williams and Tom Wopat; Tennessee Williams’ The Glass Menagerie, directed by Gordon Edelstein; Terrence McNally’s Lips Together, Teeth Apart, starring Megan Mullally, Patton Oswalt and Lil Taylor, directed by Joe Mantello. Roundabout’s sold out production of The 39 Steps made its second Broadway transfer to the Helen Hayes Theatre on January 21, 2009.